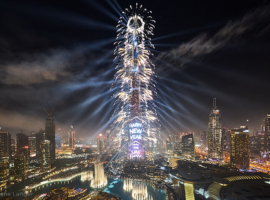 Dubai’s New Year celebrations are one of the most coveted and spectacular celebrations. 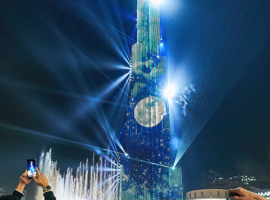 The presentation focuses on the 828 metres high landmark Burj Khalifa. 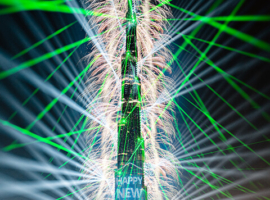 The show for New Year’s Eve 2019 demanded a stylish and energetic lighting design to blend impressive video content with spectacular fireworks. Due to AO Creative’s experience with technically complex world-class shows, the team proved that they are able to create a masterpiece of lighting and image design using many different components. The major technical and logistical challenge was mounting hundreds of fireworks, moving lights and RGB lasers safely on the outside of the building. AO Creative designed, built and tested its own custom rigging solution for the tight integration of light and pyro. This gave the super-sharp beams of light a further visual impression. The experience from last year’s Light Up 2018 show was helpful to make the 2019 installation faster and more efficient. One of the biggest challenges for the team was working at extreme heights in unpredictable weather. The safe transport of bulky, heavy equipment through the building to the top and outside was sometimes a big challenge. AO Creative worked closely with video content producers and dedicated fireworks design teams to create this complex project with many creative and technical challenges. At the same time, the team worked intensively on open and fluid communication channels between all creative and technical interest groups. One important part of the AO Creative Alliance was the renowned lighting designer Jerry P. Appelt. As in 2018, he ensured that AO Creative’s multidimensional lighting design provided breathtaking visual continuity between video and fireworks shows. 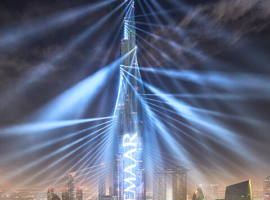 The architecture of the iconic building was not only refined, perfect and dynamically framed by the lighting, but was also extended far into the night sky of Dubai by the visual energy of the video and the fireworks. Supported by experienced technicians, riggers, engineers and designers, AO Creative provided a highly qualified event management and logistics team.